From catching a cold to landing on your feet, idiomatic expressions add color and style to the English language. 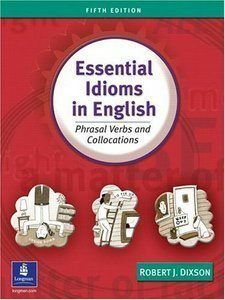 The latest edition of Essential Idioms in English remains the resource of choice for mastering more than 500 common English idioms, phrasal verbs, and collocations. Organized by level for beginning, intermediate, and advanced learners, Essential Idioms in English thoroughly defines and illustrates each idiom, then reinforces its meaning and usage with multiple-choice, true-false, fill-in-the-blank, and matching exercises. Three new sections on collocations to illustrate the frequency of certain usages. An expanded Appendix of Equivalent Idioms that adds Portuguese to the French and Spanish translations of previous editions. New eight-page section on dictionary skills helps students build their knowledge of vocabulary and usage.